Mother's Day will be here in just a few days. I always make my mom (now 94 years old) a special card, one that I put more time into than just my normal A2 cards. Hi. Marsha here with another accordion card again using Elizabeth Crafts Designs Accordion Dies. These cards are so fun to make! but so difficult to photograph ! In a previous post, I showed you how to put these together. There are also excellent videos by Elizabeth Crafts Designs on how to assemble. On this card I used several of the dies that come with the set. This is one that I like to use , first stamping an image or sentiment. Thanks for stopping by...I hope I have inspired you in some way today. Remember to stop by and play along with the Dies R Us Challenge Blog. 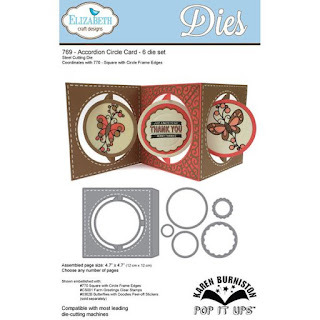 Use your die cuts to inspire us! This is so adorable Marsha! Great choice of printed papers. Each panel is a little work of art! WOW! 94! God Bless Her! She will love this adorable creation Marsha and the interaction is wonderful! Great job! My mom is 87 and going strong! We are truly blessed to still have them with us! You are so blessed to have a Mom that is still around for a Mother's Day celebration with a fabulous card like this one. Adorable images and love the dies used to create this shaped card. This is so adorable!! Your mom will love this fun and happy card!